Basically, SignalR is the abstraction of two words: Signal + R, where according to Google Signal means a gesture, action or sound that is used to convey information or instructions typically by prearrangement between the parties concerned and R stands for real-time. So SignalR is a way to allow us to create real-time applications that require high-frequency updates from the server. SignalR is an ASP.Net library developed by Microsoft that simplifies the developer works to add real-time web functionality into their application and enables the server to send the asynchronous data to the client-side applications. There are many scenarios where we can use the SignalR like Stock Exchange, Gaming, Dashboard and Monitoring, Chat server application, etc. In fig. 1.1 (1) Console Client that will receive the data from (2) SignalR and that SignalR will fetch the data from (3) database that is being continuously receiving updates from (4) 3rd party application. Now Console client will try to connect with SignalR Hub and (5) will create the Hubproxy for that. 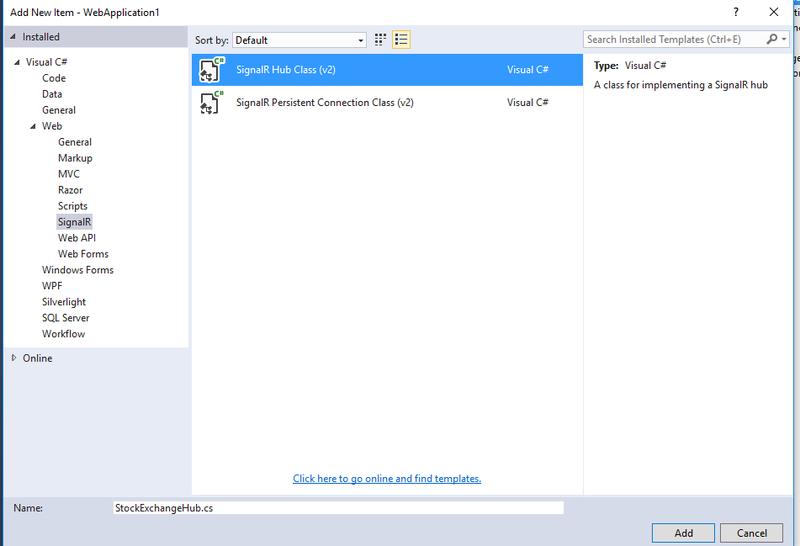 Now SignalR server will (6) fetch the data from database and will (7) push the data to the connected client. In the same way, we can connect different type of clients like Mobile client, web client, etc. and all client will receive the data once they will connect to the SignalR server. Basically, hub means a center of an effective activity or network. In SignalR hub provides the high-level communication between client and server whereas they can call a method on each other directly. Step 5: Create a model class for UserConnection. Add/replace the default code with the following code snippet. Step 2: Add a StockExchange class and replace the code with following code snippet. Now run all the three applications. I hope you understood the basics of SignalR.